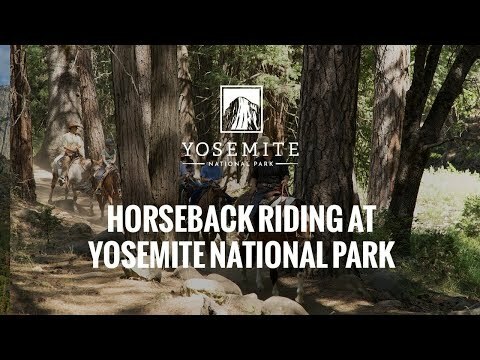 Beyond hiking, the best way to explore the trails at Yosemite National Park is on a mule ride or horseback riding adventure. Big Trees Stable offers a two-hour ride on mules and horses. No riding experience is necessary, though some rides require riders to be in good physical condition. Please arrive at the stable at least one hour prior to your ride. Children must be at least 7 years old and 44" tall. Maximum rider weight is 225 lbs. Round trip from Big Trees Stables to the Meadow Loop Trail. You’ll follow the path of early pioneers on a two-hour ride that traverses the historic wagon road. The trail will offer views of Big Trees Lodge, the Wawona Meadow Loop, a former Miwok encampment, Wawona Dome, and lush forest. Ideal for riders of all ages and abilities, the terrain is flat and the riding is gentle. How to Book: Reserve your Two-Hour Ride by clicking the "Check Rates" box in the upper-right corner, in the drop down please select "Big Trees Stable Rides"
*The Late Afternoon Tour at 2:00 pm is only offered May 24 - September 2, 2019. *Afternoon tours may be cancelled due to excessive heat. The All-Day Ride starts at Big Trees Stable in Wawona and travels to the impressive Mariposa Grove of Giant Sequoias. This is a challenging ride for experienced riders in good physical condition only. Please note the All-Day Ride is offered on Thursdays only. How to Book: Reserve your All-Day Ride by clicking the "Check Rates" box in the upper-right corner, in the drop down please select "Big Trees All Day Stable Rides"
NOTE: Riders must arrive one hour prior to scheduled ride in order to view safety video and necessary paperwork. Riders must be at least 52 inches tall and weigh 52 pounds. Riders cannot weigh more than 225 pounds. Families with children under 10 years of age are required to book the 8 am or 10 am ride times. We provide saddle bags for all riders to store water and small personal belongings. Please leave purses, backpacks and all other bags in your car, they are not permitted on the ride. We encourage parties with children to reserve morning rides versus afternoon rides to avoid warm temperatures. Big Trees Stable rides are popular throughout the season, so reservations are strongly recommended. Book reservations in advance online by clicking the "Check Rates" button in the upper right hand corner of your browser. Same-day reservations can be only made by contacting the stable at YosemiteStables@aramark.com. After consultation with our staff, stable employees will be happy to provide someone with special needs an opportunity for gentle horse ride around the corral. Yosemite High Sierra Camps Pack & Saddle Trips are offered to visitors who’ve been awarded a reservation at the High Sierra Camp through the lottery. The lottery gives you the option to apply for our 4 or 6-day guided Pack & Saddle trips. Guests on these trips will travel from camp to camp on friendly, surefooted mules. Along the way, you’ll ride deep into the High Sierra wilderness along century-old U.S. Cavalry trails—with some of the best views in all of Yosemite. Each day will begin with a delicious hot breakfast prepared by our chefs at the High Sierra Camp. You’ll saddle up and set out for the next camp—typically a three to five hour ride. You’ll spend the day taking in the gorgeous surroundings, stopping for a relaxing picnic, and filling your lens with dramatic photos of your saddle journey. When you arrive at the next camp, you’ll have time to settle in, explore, and end the day with a hearty dinner before settling in to your backcountry tent cabin for the night. Learn how to apply for the High Sierra Camp Lottery—the first step in planning a Yosemite High Sierra Camp Pack & Saddle Trip. Horse boarding is offered at the Yosemite Valley Stable. Reservations are highly recommended due to limited space. Contact 209.382.8326. Proof of immunizations for Rabies, West Nile, Influenza, Eastern and Western Encephalomyelitis (Sleeping Sickness), and Tetanus, plus a current Veterinary Health certificate, current Negative Coggins (AGID), and recent worming. NOTE: The stable does not allow boarding for stallions. The Dog Kennel is available at Yosemite Valley Stable. Because of limited kennel space, advance reservations are highly recommended, please call 209.382.8326. You must provide written proof of immunizations (rabies, distemper, parvo and bordetella) from your veterinarian. NOTE: Dog kennel payments are made at Half Dome Village Tour Desk, not at the stables. Yosemite Mountaineering School - Book your expert guided trip today.